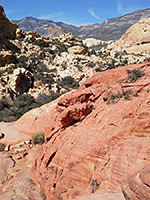 One of the most popular hiking locations in Red Rock Canyon National Conservation Area is the Calico Hills, a sizeable outcrop of richly-colored Aztec sandstone, separated from the main line of cliffs by a few miles of desert plains. 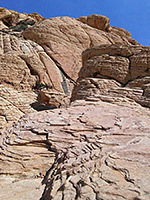 The southern half of the hills are uniformly deep red, due to the presence of iron oxide, while the northern section is mostly white or cream; the differences do not correspond to particular strata, but are instead thought to be caused by the relative amount of water and air present during the sandstone formation. 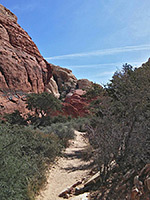 There are three trailheads along the scenic loop road at the base of the hills on the southwest side, and three more to the east in Calico Basin, all linked by a 6 mile loop path, though most people just walk part of the way, or climb a short distance, off-trail, up the hills - although some parts have sheer cliffs, popular for rock climbers, others have little ravines and more gentle slopes, ideal for scrambling. 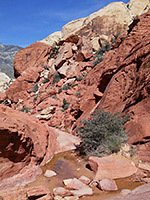 The one official path into the hills is the 1.2 mile Calico Tanks Trail, which starts across flat land on the north side then turns southeast, following a straight, increasingly rocky valley to a viewpoint beside a large tank, or cavity, which retains water for a long time after rainfall. 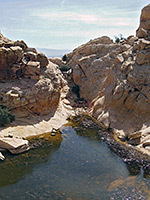 Smaller pools may be present nearby, in the upper reaches of the ravine, which is wide and gently sloping lower down, narrower and steeper higher up. 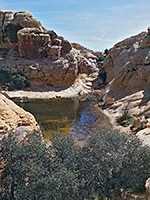 The hike to the Calico Tanks begins from the Sandstone Quarry trailhead, just off the scenic loop road by the north end of the Calico Hills, 2.5 miles from the visitor center. This location was used as a quarry between 1905 and 1912, and some white sandstone blocks excavated at that time can still be seen. The path heads north from the far edge of the parking lot, alongside a line of bushes to an open area at the foot of some cliffs, then moves to the west, across a broad, gravelly wash. Just before the crossing, on the east side, is the quarry, where several dozen sandstone blocks remain beside the cuts and flat surfaces of the excavation site. 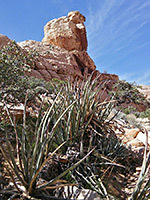 The path continues northwards, close to the wash, past a junction with the Turtlehead Peak Trail, then crosses back to the east side of the drainage and up a narrower tributary wash, through a gap between two white sandstone cliffs and on past a clump of oak trees, into a broad valley. The streambed continues northwards, but the path soon turns southeast, following the valley all the way to the tanks, reached after another 0.7 miles. 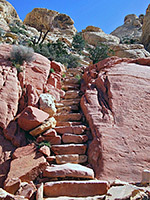 The route is mostly sandy, becoming more rocky at higher elevations, and a few of the steepest places have constructed steps. The surrounding rocks are always white to the south, mostly red to the north, though in the vicinity of the main tank, all are white. The tank can hold several feet of water in wetter times though may be totally dry during summer. 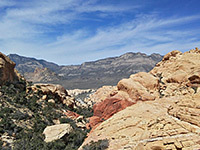 The best viewpoint is from a saddle 100 feet beyond here, as ahead, the land slopes down steadily to the southeast, allowing unobscured views across Calico Basin towards Las Vegas.